For three years I was the lead engineering analyst for a leading AUV & Remotely Operated Vehicle (ROV) manufacturer. All engineering design was done with the SolidWorks 3D solid modeler. 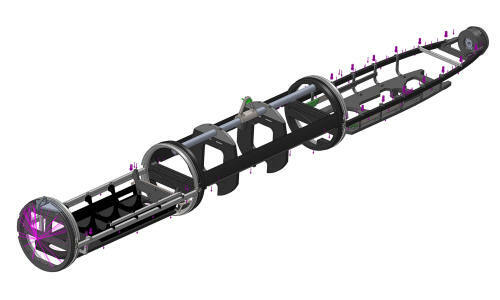 Engineering analysis was conducted with Autodesk Simulation Mechanical FEA and SolidWorks Simulation Premium FEA for many stress and dynamic analyses on AUV's, ROV's, lift and tow assemblies, and docking stations. 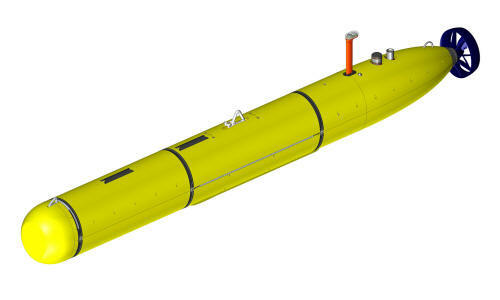 These AUV's are "wet" vehicles with seawater entrained inside and interior watertight and pressure resistant housings for specific operational and payload modules. Typical payloads include sophisticated sonar systems and/or video and still cameras. Numerous Mathcad and Excel computations were carried out to determine loads, bending moments, shear forces, and boundary conditions. Weld analyses and bolted joint analyses were also conducted via Mathcad, Excel, and FEA model interpretation. 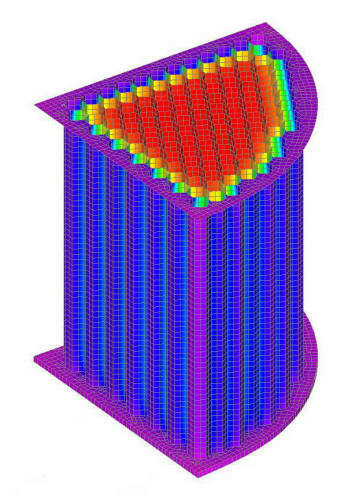 These results are from quarter symmetry 3D Nastran FEA plate element models of a wet electrostatic precipitator which is used to remove particulate fly ash from smoke stacks. Ten FEA analyses were conducted for steady state temperature, thermal strain, thermal stress, buckling, and structural stress for different thermal loads, and boundary conditions. Numerous Mathcad documents and Excel spreadsheets were developed to define both forced convection and natural convection fluid dynamic and thermodynamic boundary conditions. Once the thermal problems were defined, DeepSoft, LLC. developed an innovative hanger solution that allowed the client to solve severe thermal stress and buckling problems they were having during abnormal operating conditions. DeepSoft, LLC. is celebrating twenty successful years of providing engineering services locally, and nationally. FEA-CAE-Engineering.com is the Finite Element Analysis (FEA) & Computer Aided Engineering (CAE) specific website for DeepSoft, LLC. an independent consulting engineering firm specializing in engineering analysis, mechanical design, and virtual product development. DeepSoft, LLC. utilizes state of the art FEA & CAE engineering software tools coupled with over twenty years of engineering analysis and design experience to help you solve engineering and manufacturing problems. DeepSoft, LLC. has performed stress, thermal, and dynamic analyses with NEi Nastran / Femap as well as Autodesk / Algor on many projects as well as mechanical design with leading edge 3D solid modelers such as Inventor, SolidWorks, & SpaceClaim. We want to become your FEA & CAE online resource, whether working locally or remotely on your applications. DeepSoft, LLC. can assist you in making the transition from working in 2D to doing everything in 3D. 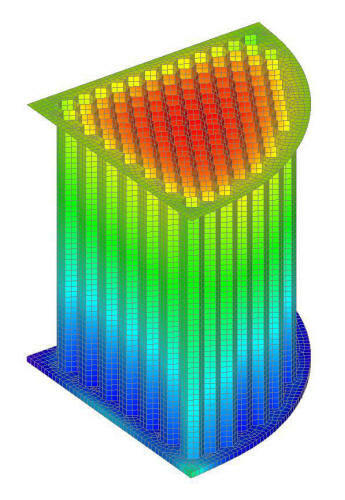 3D solid model based CAE & FEA tools are very powerful but have significant learning curves. We have been working with both of these technologies for many years and can either do the work for you or assist your staff in performing the work in house. Download the DeepSoft, LLC. Engineering Analysis & Design brochure in PDF format (350 Kb). You can save the file to your system and print it with the Adobe Acrobat Reader. Use the Back button in your web browser to return to here. DeepSoft, LLC. is an independent consulting engineering firm that assists clients in developing new products, evaluating or redesigning existing products, analyzing failures, or who require engineering analysis services. 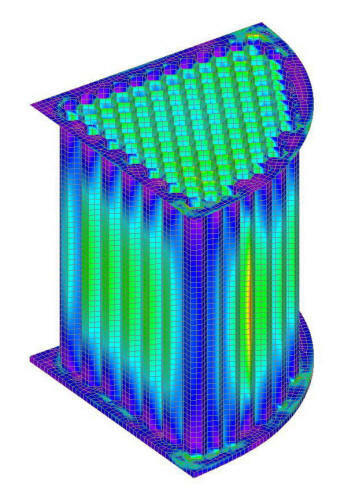 We provide answers to complex questions using state of the art engineering software tools like Nastran, Femap, Autodesk / Algor, for stress, thermal, and dynamic FEA. Complex 3D solid and surface models can be created with Inventor Professional, SolidWorks, or SpaceClaim for new designs. Existing product designs can be converted from older legacy CAD tools to Inventor Professional, SolidWorks, or SpaceClaim. For virtual product development, we can accept (or create) 3D solid or surface geometry in Inventor, SolidWorks, or SpaceClaim native formats as well as all neutral file formats: IGES, STEP, ACIS, and Parasolid. SpaceClaim provides the ability to import virtually any 3D solid modeler native format, make geometry changes as necessary - including manufacturing changes, and export to any neutral file format. This capability is essential for analysts who only want to see a structurally significant model not all of the minute detail required by a design engineer. Ted K. Fryberger, PE, the principal of DeepSoft, LLC. has over twenty years of engineering analysis and design experience in the defense, manufacturing, material handling, nuclear waste, environmental, oceanographic, and electronics industries. This experience has included a wide range of product types including: manufacturing machinery, hoists, diving and deep submergence equipment, US Navy's standard missile, US Army's portable ultrasonic cleaner, US Navy's submersible, nuclear waste vitrification melters, printed circuit boards, wet electrostatic precipitators, and new product development.